Where does the time go? I’m back with some updates, links you can use, and whatnot. 1. The new trash and recycling bins. I’ve seen them being distributed, but the start date for this is February 6. HERE is a little announcement on the Town’s website. There was a set of instructions and a calendar attached to your barrels, but, if you lost it, we have copies here. 2. It’s Tax Time. We’ve received notice that the IRS is not sending out the forms we requested waaayy back in September. Their budget was cut, so they are only sending the 1040, 1040A, and 1040EZ forms, and no instruction books. We will be getting a set of reproducible forms, and one set of instruction books that can be photocopied. The IRS strongly urges you to use their website www.irs.gov, but you can call 1-800-829-3676 to order some to be sent to you by mail. Remember that only public libraries carry IRS forms. I’ve put in a request for state tax forms, and will post an announcement here and on the Facebook page when they arrive. 3. Our website is still under construction, but is nearing completion. We thank Karen and Dan at Design Principles in Marion for their assistance in this. 4. The Nonfiction Book Group discusses Lies My Teacher Told Me by James Loewen tomorrow (1/16) at 6:30. Our February book is the popular Dark Tide, about the Boston molasses flood. Cafe Parlez will discuss Remarkable Creatures on Thursday, January 29 at 6:30. 5. The backpacks for MOBY (My Own Back Yard), the grant we are doing with the Marion and Mattapoisett libraries, are in the testing phase. If you are in grades 3-8 and would like to be a tester, please speak to the Library Director or to Mrs. Lisa. 6. 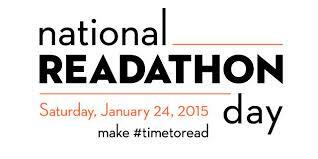 The Plumb Library has a team for the National Readathon Day, January 24. If you’d like to join our team or make a pledge to help The National Book Foundation, go HERE and look for the Joseph H. Plumb Memorial Library team. If you do join our team, you sit and read on January 24 between noon and 4:00 p.m. Or you can listen to an audiobook. If you need a book for your device, visit the SAILS Overdrive account. New books are constantly being added. Ask us for assistance if you need it. 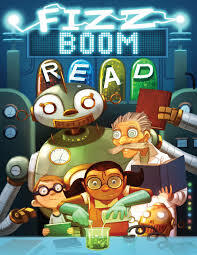 To register for “Fizz Boom Read!” for ages 3-9; “Spark a Reaction” for ages 10-17; and “Literary Elements” for adult, go to http://www.readsinma.org/rochester and click on the appropriate tab. Logging times will start on June 18. The kickoff show is Mike the Bubbleman on June 23 at 3:30 p.m. in the Fellowship Hall of the First Congregational Church next door to the library. All readers are eligible for prizes, including books, and prizes from the Boston Bruins, one of our sponsors. To access the ORRJHS summer reading list, click on http://orrjhslibrary.weebly.com/summer-reading-gr-7.html for 7th grade, and http://orrjhslibrary.weebly.com/summer-reading-gr-8.html for the 8th grade list. We will list more links for school reading lists when we get them. We have copies of most of the books, and can get more copies through the SAILS system. The TriTown is celebrating Science! Come enjoy interactive Science, Technology, Engineering or Math fun with your family in Marion, Mattapoisett, and Rochester! All activities are geared to children 3-9 and their grown-ups. Families will work together to conduct simple STEM hands-on activities. Plumb Library will be hosting programs on June 24, 25, 27 and 28 at 11 am – 12 pm. For each session, there will be a take home activity. Sessions could focus on any of the following! This program is sponsored by the CFCE Program of the ORR School District with funding from the Massachusetts Department of Early Education and Care’s Coordinated Family and Community Engagement Grant. Drop by the library on the days and times listed to take part in these activities. 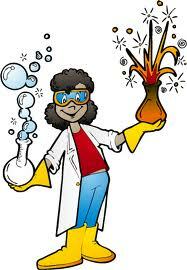 Someone will be there to assist the budding mad scientists. When you’re making your New Year’s Resolutions, think about your reading habit. Whether you are analog (love the feel of regular books) or digital (can’t give up my device), these will pertain to you. Thanks to the blog Book Riot. 1. 3 Steps to Reading Harder, Better, Faster, Stronger: http://bookriot.com/2013/12/26/3-steps-reading-harder-better-faster-stronger/ I like the suggestion to carve out your reading time. Schedule it as part of your day. I once read a manners suggestion not to read at meals. Well, forget that! Unless there’s company, go ahead and prop the book up in front of your plate. 2. Go from Zero to Well-Read in 100 Books: http://bookriot.com/2013/12/26/go-zero-well-read-100-books/ OK, this list is not bad as a start (though what Fifty Shades of Grey is doing on it I don’t know). I’ve read a bunch of them, and try to read at least one classic during the summer, so will reference this list for next year’s. 3. Read Outside of Your Comfort Zone: http://bookriot.com/2013/12/26/reading-outside-comfort-zone/ For me, that would be romances. Or maybe biographies. What would that mean for you? If it’s science fiction or fantasy, as us for a recommendation. Don’t forget that if you received a new device, such as an iPad, Nook, Kindle, etc., as a gift, we can help you set it up with Overdrive. Call us!! Or email info@plumblibrary.com and ask for an appointment. When you come to your session, be sure to bring your library card, we cannot proceed without it. If you have a Kindle, bring your Amazon login info. If you have a password with Adobe Digital Editions, bring that too. We can also set you up to download free music from Freegal, and magazines from Zinio. And don’t forget the BookMyne app. It’s an easy way to access your SAILS account, search, reserve, and renew books and other materials. Ask us for a demonstration. Here is our annual list. Not much duplication this year, and the page’s selections put ours to shame. Gail and Lisa lean toward sci-fi and fantasy, as usual. Dear Reader: Did you know…? This details the first national Thanksgiving celebrated in New York City, shortly after the Draft Riots. We here at Plumb hope you have a great Thanksgiving. And don’t forget: we close Wednesday (that’s today) at 2:00, and reopen Saturday at 10:00. Regular hours resume next week. 1. The Friends are taking orders for wreaths. Check our website for the order form, or stop by the library. 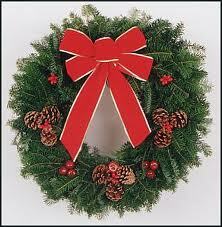 Pick up your wreaths at the Holiday Open House on Dec. 7. 2. The Holiday Open House is from 10:00 a.m. – 3:00 p.m. on Saturday, Dec. 7. If you have something to donate to the Silent Auction, please bring it to the library no later than Wednesday, Dec. 5. We also have a signup sheet at the desk for the Bake Sale. The Brownies will be caroling, the Junior Friends will have their Kid’s Table, and there will be coffee, tea, and cider. 3. Starting Dec.1, we will have our annual Food for Fines collection drive. Donate a non-perishable food item for Damien’s Pantry, or cat food for It’s All About the Animals cat shelter, or dog food for the Fairhaven Animal Shelter, drop them by the library between Dec. 1 and Dec. 26. If you donate an item, we will waive your fines. This does not cover lost books, lost library cards, or copying fees. 4. 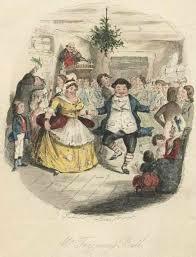 On Saturday, Dec. 14, we will hold a marathon reading of Charles Dickens’ “A Christmas Carol”. We have readers, but we’re looking for another understudy. If you’re interested, contact us at the library. The reading starts at 11:00 a.m, and should last until 3:00, with a break and a short discussion after. Plan to take a break from the holiday madness. 5. Our holiday hours: we will close next week on Wednesday, 11/27 at 2:00 so our carpets can be cleaned. We will be closed for Thanksgiving, and for the day after, 11/28 & 11/29. Our regular hours will resume on Saturday, 11/30 at 10:00. 6. The Cafe Parlez book group will meet this coming Monday, 11/25, at 6:30, since the last Thursday of the month is Thanksgiving. They’re reading 22 Britannia Road. Jen is assembling the list for 2014, and it looks good. Now a couple of fun items. First, the National Book Awards were awarded last night. Check their website HERE to see the titles. Watch this space for the Plumb Library staff’s annual Top Ten Books that We Read lists. Jen is making a bulletin board displaying the titles. Oddly this year, none of us liked the same books. More later! Lastly, here is a fun little video from those merry pranksters at Improv Everywhere. They’ve been doing things like having someone acting and dressed like Gandalf challenging people crossing a bridge in Central Park. 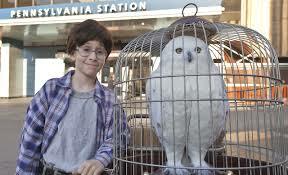 This time, they’ve got Harry Potter at Penn Station looking for Platform 9 3/4. Check it out from Bookshelves of Doom.